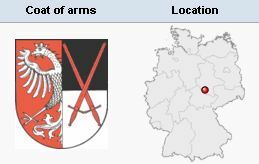 Allstedt (population in 2012, 8,193), a village in Thuringia, Germany, where Erhard Polrus or Pulrus, an Anabaptist leader, was executed as a martyr in 1532 after repeated torture. In 1523 Thomas Müntzer was the parson of Allstedt. Wappler, Paul. Die Täuferbewegung in Thüringen von 1526-1584. Jena: Gustav Fisher, 1913: 536. Wiswedel, Wilhelm. Bilder and Führergestalten aus dem Täufertum, 3 vols. Kassel: J.G. Oncken Verlag, 1928-1952: v. I, 89. Hege, Christian. "Allstedt (Sachsen-Anhalt, Germany)." Global Anabaptist Mennonite Encyclopedia Online. 1953. Web. 18 Apr 2019. http://gameo.org/index.php?title=Allstedt_(Sachsen-Anhalt,_Germany)&oldid=132607. Hege, Christian. (1953). Allstedt (Sachsen-Anhalt, Germany). Global Anabaptist Mennonite Encyclopedia Online. Retrieved 18 April 2019, from http://gameo.org/index.php?title=Allstedt_(Sachsen-Anhalt,_Germany)&oldid=132607. Adapted by permission of Herald Press, Harrisonburg, Virginia, from Mennonite Encyclopedia, Vol. 1, p. 63. All rights reserved. This page was last modified on 11 August 2015, at 16:51.